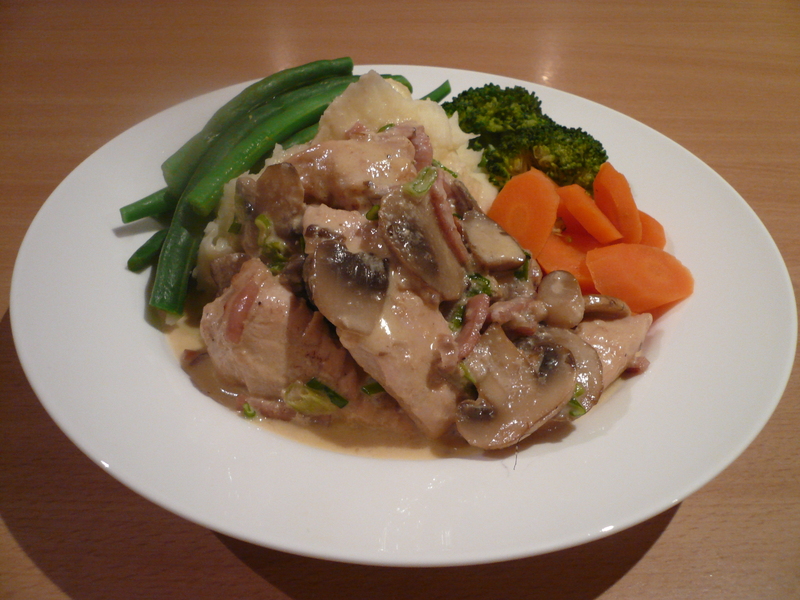 I have a recipe for a yummy but somewhat complicated french chicken casserole, which is just not very achievable in a busy week. It’s unfortunate, because it tastes so good! The recipe that follows is my attempt to get around this problem. Using all the same ingredients, I’ve fiddled a bit to make something very similar in less than half an hour. If you’re worried about the fat content in the cream, feel free to replace it for lite and creamy evaporated milk, and if you don’t like mushrooms just leave them out. I hope you enjoy this fast, easy, affordable and gluten free dinner. Total cost less than $12 and serves 6. In a large frypan, brown off bacon, leek and mushrooms. Remove from pan and set aside. Return pan to heat and brown chicken pieces on all sides, but leave uncooked in the middle. Return mushrooms, leek and bacon to pan with the chicken and pour over cream and white wine. Simmer gently with lid on for 15-20 mins stirring relatively often to prevent catching. While chicken is simmering, prepare any vegetables you’d like to serve it with (mash potato, carrots, beans and broccoli work well). Sprinkle thyme and grated parmesan over the chicken mixture and stir gently until melted and combined. Allow mixture to thicken and season with salt and pepper. Serve on mashed potato or rice with steamed vegetables. Thanks so much! I’ve been looking for a gluten-free meal like this so I can invite over some friends from church who are gluten-free. It’s a bit intimidating cooking for someone with a special diet but this will help my confidence. I feel a bit silly saying that again the sauce was pretty runny. I have runny sauce issues! But the taste was delicious. One thing I wasn’t sure of when I read the recipe… where it says “Allow mixture to thicken and season with salt and pepper”, is that on the heat still or resting? Hi Deb. Yeah it should reduce down on low heat and thicken with the addition of the parmesan. Nice recipie but I have 1 question.How much and what sort of white wine(sweet/not sweet) should you put in the recipie? Hi Barry, Just realised I forgot to add the 1/2 cup of dry white wine to the ingredients list. Just fixed it up now. Thanks! I made this recipe and it got a HUGE thumbs up from our whole family (5 of us). It was completely yum and one that I will be using when we have visitors. Thanks for sharing your recipes. I made this last night and it was an instant hit with the whole family – thank you! We’re going to try the cheese and bacon muffins today!